Pineapple is a wet/moisture bearing topping, which releases water when cooked: the result of which can be a soggy crust. While pineapple is not an ideal pizza topping, it may be helped by being applied directly to the pizza surface by a qualified professional with the appropriate certifications in moisture removal procedures. 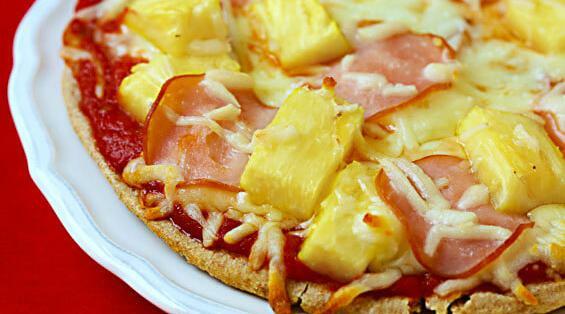 When pineapple is roasted before going on the raw pizza you caramelize natural sugars and get rid of excess water. Pineapple, being a wet topping, makes pizza unpalatable when the taste and texture get messed up from the pizza getting soaked from its juices. The wateriness of the pizza lets one not need to drink as much, as the food becomes both food and drink. There are simpler options that do not require a trained chef to perform (i.e. keeping a pizza dry from pineapple's added moisture).